This was a jointly sponsored project with the Dalai Lama Foundation. Begun in 2007, the students participated in the development of a curriculum based on the Dalai Lama’s book, Ethics for the New Millennium. In the project, students from Mount Madonna School, the Creative Minds Academy in Nigeria and the Tibetan's Children Village in India engaged in a yearlong inquiry into the nature of lasting happiness. 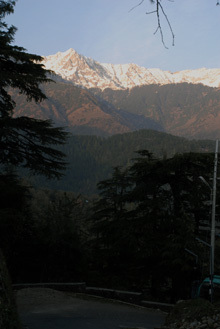 The project took the students to India to interview the Dalai Lama and resulted in a feature length movie, which goes into release in 2008-09. Today we arrived in Pathankot in Punjab after our eleven hour train ride from Delhi. We all separated into several different four-wheel Toyota vehicles. In my car there was John Sorensen (the documentary producer), Mark, Prabha, and I. The day before John had bought some popular Indian dance music and got the CDs out so we could listen to them on our three hour drive to Dharamsala. It was a lot of fun dancing, singing and laughing along with the songs in the car. We also screamed every once in a while as our driver passed within inches of other cars, people, or animals in the road. It was almost impossible to relax and fall asleep because the roads were very windy and I felt compelled to watch what our driver was doing. Also the scenery was an incredible change from what we had gotten used to in Delhi. The first thing that I noticed was the incredible snow capped Himalayas, and the rows and rows of cut tea on the hillsides. 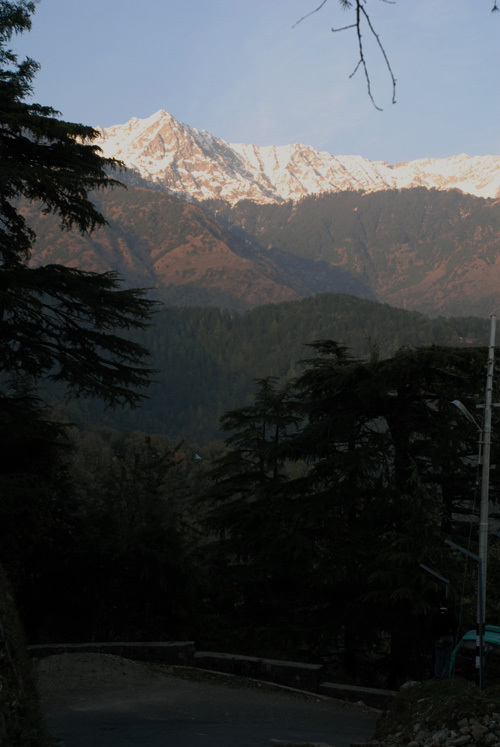 Arriving in Dharamsala was a lot calmer. There weren’t as many people, and their style of living was different. I feel a lot more relaxed up here and just happier in general. My backyard is a view of an apple orchard and oak trees. The kids at Tibetan Children’s Village(TCV) have the Himalayas. We’re in the foothills here at 6000 feet and they are towering above us, natural beauty at a magnificent scale. I am missing my family and friends whom I haven’t seen in two and a half weeks. Some of these kids haven’t seen their families in over a decade. One boy I met told me that his father carried him on his back over the mountains when he was three years old and then turned around and walked back. He has seen his parents only once since. I feel like I am worlds away from the US and India. We’re in “Little Tibet” now and I am loving it. The people aren’t in your face, it doesn’t go along with their beliefs. It’s starting to hit me that we are meeting the leader of these people. What an honor, what a culture, what magnificent people, and what a location. Today was the first day that we met and visited with our counter-parts in this project from the Tibetan Children’s Village (TCV). As we arrived we were greeted with friendly faces and a short, but intense, game of basketball, before we quickly filed into their assembly hall for a cultural presentation. The Tibetan students performed several dances for us, and one in particular was choreographed by a boy who also was playing a Tibetan guitar during the performance; he prefaced the dance by saying he woke up every morning happy because of this dance, and it wasn’t until later that I found out why. We took our leave after the assembly and managed to get a few minutes of rest before we sat down to dinner. It was a surprise to me when we were joined by the 12th class (12th grade) from the TCV. I sat down at a table occupied by none other than the boy who choreographed the dance and played the Tibetan guitar. “I come from a village very near to the border to Nepal where I lived with my family until I was about 11 years old. We had a house with a beautiful pasture where we used to gather in small groups and dance and sing. This is where the dance we performed for you at the assembly came from. It reminded me of home. Curious about his life, I asked him how he got to the TCV where I met him. “One day in Tibet my father told me that we were going to cross the border into Nepal. Our village was very close, but it was still a 3 or 4 day walk to the border. We could only walk at night; we slept during the day. “Right before the border there is a very fast river. Normally we throw ropes across and help each other across, but it is still very dangerous. Two people from the group I traveled with lost their lives. I remember the water being very cold that day. But when we were across the river it was still very dangerous. The Nepali people at the border are asking us Tibetans for money, because if we do not give them enough money, they turn us into the Chinese who will give them money. We reached a check-post and we got enough money together in our group to go past the Nepali guards. “My father and I walked to the bus station and took a bus to my Auntie who lived in Nepal. From there she sent me to Delhi and I went to one branch of the TCV schools until class 10, where I decided to take the stream of science (the three streams are: science, commerce and art) so that I could study medicine, and that is how I came to be at the (Dharamsala) school today. I have not seen my father since I left Nepal; he went back to Tibet to care for my mother. I sat and listened to his story in awe. Both by the magnitude of the story itself, but also with his openness in telling it. He did not seem sad at any point; in fact, quite the opposite. He smiled at times during his story. Time was running out though, and they all had to go back to their Hostel soon, but I was focused entirely on him by this point. “How is it now, being so far away from home?” I asked, emboldened by his openness. Dinner with the 12th grade TCV students working on the Happiness Project with us began in the same way all introductory meals do: people glancing over their water glasses to analyze their new acquaintances, the awkward restlessness of hovering forks waiting for the “polite” moment to eat, and strained silence. We danced in this uncomfortable tango, waiting for the ice to be broken, but not daring to tread upon it. Then, recognizing the discomfort of the situation, Tenzin, a member of the Dalai Lama Foundation, proposed a question to the TCV students. When Tenzin asked the girls at the table what they were interested in doing after graduation, the group elicited an all too familiar groan. They, like us, have undergone a year of being pestered and probed with questions regarding the future, and it became clear to us that the profound distaste for these questions is universal. With that, the tension between us was broken. We conversed in universal teen-speak, we smiled universal smiles, we laughed universal laughs. Once we established our first connection, our similarities began to emerge and shine. The dialogue carried on in this way, reaching the peak of our newfound comfort when the girls asked me to sing an Enrique Inglesias song. But before their goads and prods could convince me to imitate the Latin pop-star, the TCV students were required to return to their dormitories. Despite the abrupt end to our bonding session, we were able to make tremendous progress tearing down the divisions between our cultures in just one day. I can’t wait to see what else we can achieve in the rest of the time we spend here.